Home Latest The little railway that could! The little railway that could! 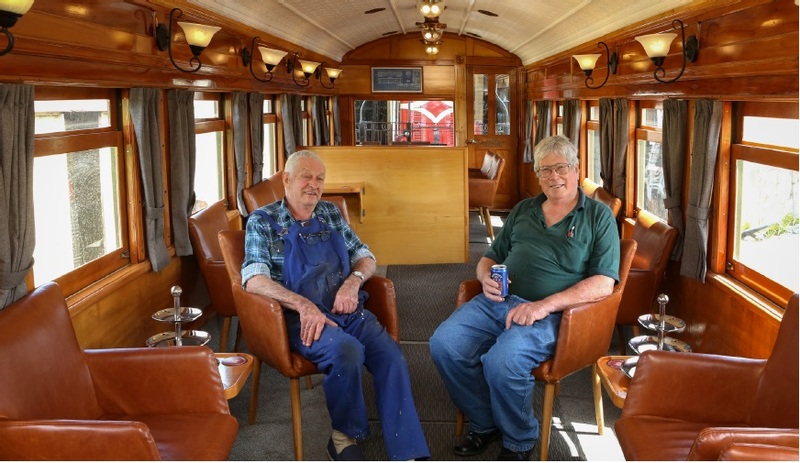 They may not work on the railroad all the livelong day, but John St Julian and Alan Carline have both been helping keep the wheels at Glenbrook Vintage Railway in spin for many years, as JON RAWLINSON recently discovered. I’m a Thomas the Tank Engine fan and have been since childhood when a certain former musician used to tell me (on the telly) all about this lovable loco’s adventures. But, unless Ringo Starr accepts my invitation to Glenbrook Vintage Railway’s next ‘Day out with Thomas’, I think I’ll go off the Beatles a bit! Providing an experience faithful (or as near as possible) to the world of Thomas (aka a 1950s’ Bagnall) has been a labour of love for long-time volunteer, John St Julian, since Glenbrook Vintage Railway (GVR) began running these events. “The faces have to be just right and if we have a name on an engine, it needs to be covered up. They even send people over to check everything is being run as it should. The events are costly to run, but they are very popular too,” he explains. One upcoming addition is a dining car offering a first class experience suited to adults and families as well as big kids like me. It’s expected to join the historic railway’s regular schedule next year. Visitors will be able to enjoy three or four courses of restaurant quality meals as well as beverages while drinking in the scenery as they steam through the countryside, 1920s style. “The parlour [bar] car, which launched on Queen’s Birthday Weekend this year, has been half the job. I’ve been the main instigator of this project but Al [Alan Carline] has done most of the physical work on the carriages. I’m very keen to see it succeed,” says John. Extra revenue which should roll in as a result will be put to good use by the Railway Enthusiasts Society (which operates GVR) in preserving a little slice of our past. Earlier this year, a turntable was added to Glenbrook Station. This allows engines to be more easily and cost effectively turned around. But, because what goes around will come around, another good turn is also waiting on the wayside. The roundhouse will be as faithful a recreation as possible, yet will be more accessible to visitors than those of days gone by, John explains. More recent additions, two 1950s’ diesel locomotives, will also help raise funds to further shunt plans in the right direction, including more excursions on the mainline. “Our steam excursions can’t travel as far because of crewing issues. There are very few steam-qualified drivers these days and they can run out of hours, whereas there are plenty more guys qualified to drive diesels,” adds John. In the meantime, Thomas also continues to play his part at pulling in the punters. So, Ringo (or can I call you Richard?) just in case you do read Rural Living, give us a ring, or reply to our emails; I’m sure plenty of Starr-struck children as well as Thomas and all others aboard would be happy to make room for one more. Following the closure of the old Waiuku branch line in the late 1960s, the Railway Enthusiasts Society set about preserving its steam heritage by establishing the Glenbrook Vintage Railway (GVR). At the time, Alan Carline was there and, 40 years later, he still is! GVR’s rolling stock dates back to the 1880s, although the oldest engine no longer runs; in a way, Alan doesn’t run either…when it comes to driving, that is. “I mainly work on the carriages these days. My reflexes have slowed down a bit so I thought I’d give the young jokers a go,” he smiles. ‘Loco’ about locomotives since he was a child, Alan followed a family tradition – which included grandfather and great uncles – of life on the lines. And yet, when GVR’s first engine rolled out of the station in 1977, the former builder from the North Shore answered the call of the steam whistle. Just a year later, John St Julian – who had also long harboured a head full of dreams of steam – joined Alan at the railway. “I’m a steam nut from way back,” John reveals. “I was raised right beside the main northern line out of Sydney so I saw all sorts of trains (mainly steam) when I was a young fellow. In 1971, John was transferred to Christchurch, where he became involved with the Ferrymead Railway and acquired his ‘driver’s ticket.’ Following a further transfer in 1978 he joined the team at GVR. However, a hectic work schedule from the mid ‘80s kept John too busy (ironically) with travel to volunteer. “I was engineering manager for Goodman Fielder and we had operations throughout Australia and the Pacific. At one stage, I was overseeing the engineering at 17 mills,” he says. After he retired in 2005, John was back working on the railroad, his engineering experience proving most beneficial. “My input into this place has mainly been mechanical and engineering. For me, it’s often more fun fixing things than driving,” he says.